1. How did you get started in mosaic art? Arts and crafts have always been present in my life. My formal training in art was at Framingham State University. Then, about 5 years ago, while attending an open studio at the Fountain Street Studios in Framingham, I met Cheryl Cohen, who was exhibiting and provided my first exposure to contemporary mosaic art. About 6 months later I signed up for a few lessons with Cheryl. Unfortunately, I did not continue with mosaics at that time. I went on to take many classes and workshops in abstract painting, mixed media collage, jewelry, experimental acrylics and stained and fused glass. 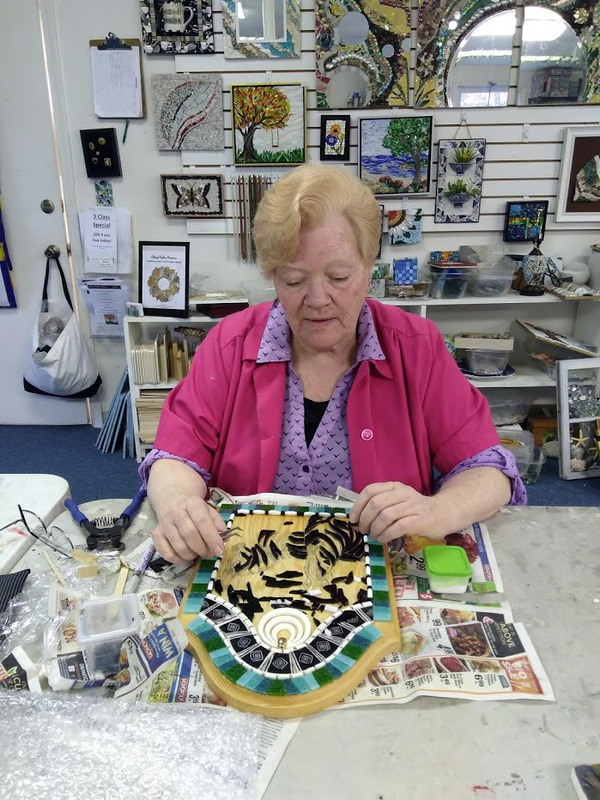 I rediscovered Cheryl in her Holliston studio a little more than a year ago and after a few classes and workshops I was addicted to mosaics. I attend at least weekly and am running out of space at home to store all my materials. That’s an easy one. It is the materials, color and the flow of nature. ” I begin with an idea, and then it becomes something else.” (Pablo Picasso) Although I start with an idea, I am flexible and respect where the materials take me. 3. What is your favorite material and why? At this stage, I am still experimenting with materials and will use absolutely anything from nuts and bolts to bits of discarded thin set. So, my favorite material is the one that is currently in my hand. 4. Where would you like to see your art go over the next few years? I want to continue to learn additional techniques, refine my skills, and conquer my fear of working larger than a square foot. The Amanda Edwards’ mural at the Ronald McDonald House, Portland, ME and Cherie Bosela’s Diversity Mural in Orlando, FL provided me the privilege of contributing, in a small way, to two community projects. I would love to find additional community projects to which I could contribute. 5. Share a tip, either mosaic or life? Laura Rendlen provided this tip and it applies to both mosaics and life. If there is something in your piece that you don’t quite like or you are not sure about, get rid of it. If you don’t, you will never be happy with the finished product. 6. Why do you mosaic? To maintain my sanity and battle depression. Mosaics provides me a sense of accomplishment, pride and constantly challenges my creativity and skills. For each new piece my goal is to try something new, either a new technique or material. Through membership in NEMS, SAMA and Cheryl Cohen’s studio, I found a like-minded community of very special artists who are willing to share knowledge, techniques, and compassion. How exciting it is when someone looks at my piece and can share my vision? 7. What is the best workshop you have taken and why? Each workshop I attended this year taught me something valuable and I am grateful to each of them: Cheryl Cohen’s Glass and Resin on windows, Amy Marks’ Polymer Clay Mosaics, Meagan Corrado’s Mixed Media Mosaics, Pam Straton’s Wonderful Potential of Smalti, Laura Rendlen’s Creating a Garden with Color, Texture and Light.